At an interesting moment in the constitutional history of Scotland and the United Kingdom, the Scottish Poetry Library and Bloodaxe Books bring you an alternative A to Z of the British Isles. 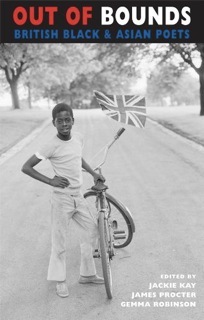 Co-edited by Jackie Kay, Out of Bounds (Bloodaxe) is an inventive reworking of the map of Britain – from Aberdeen to the Isle of Wight – as viewed by its black and Asian poets. On Thursday, 24 October, some of the poets featured in Out of Bounds will perform in the Scottish Poetry Library. Poets taking part include Vahni Capildeo, Bashabi Fraser, Irfan Merchant and Tawona Sithole. Occasionally disturbing, often funny, and even hopeful, the poetry of Out Of Bounds depicts a Scotland whose various people already embody the change the debate on Independence is exploring. 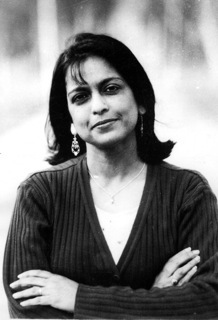 From Irfan Merchant’s humorous and proud account of how the chicken tikka masala was invented in Glasgow to Kokumo Rock’s account of experiencing racism on a trip to Tesco; from George Murevesi’s miserable experience of the Scottish weather to Bashabi Fraser’s vision of the cultures of her native and adopted homelands blended in a tartan turban – these poets explore notions of Scottishness at a crucial period of self-examination for all Scots, whether pro- or anti-Independence, as we consider what the country will look like in the future. 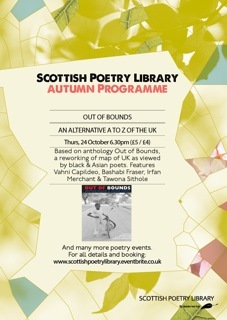 Out of Bounds takes place on Thursday, 24 October, 6.30pm, at the Scottish Poetry Library. Tickets are £5 (£4 concessions). Tickets can be bought in person at the SPL or online Click Here to buy.